iNFekt NFO Viewer is a portable text viewer application that has been carefully designed around its main task: viewing and presenting NFO files. It comes with three different view modes (Rendered, Classic and Text Only), export functionality and lots of options! All Windows versions starting with Windows XP are supported. 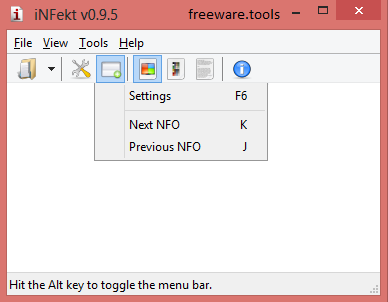 iNFekt works very well with Windows 7, 8 and is available in a native 64 bit version. It's a simple-to-use program that helps you open NFO files, switch between three different viewing modes. Given this tool is a portable edition, no installation is required to use it. This is the portable edition of iNFekt, a small and useful application for viewing the content of NFO-formatted files, specifically NFO, DIZ and ASC. It contains basic options that can be tweaked by all user categories. As there is no setup pack involved, you can drop the program files in a custom directory on the hard disk and just click the executable to run. There is also the possibility of saving iNFekt to a USB flash disk or similar storage unit, in order to run it on any PC with minimum effort and no previous installers. An important aspect to take into account is that the Windows registry does not get updated with new keys, and no extra files are created on the disk without your consent, leaving it clean after removal. The interface is represented by a normal window with a minimalistic structure, where NFO items can be imported using either the file browser or drag-and-drop support. Standard word processing functions include copying text selections to the Clipboard, along with zooming in and out. The viewing mode can be toggled between rendered, classic and text only, while the frame can be set to stay on top of other windows. It is possible to hide the tool and status bars, reload text, as well as export the document to PNG (regular or transparent), UTF-8 or UTF-16 text file, CP 437 NFO, HTML or PDF (normal or DIN size). As far as program settings are concerned, iNFekt is able to remember recent files, show normal text, hyperlinks, glow effect, background and block art in customized colors, and so on. iNFekt does not concern the overall performance of the PC, as it uses low CPU and RAM. It is very responsive to commands and works fine, without causing the OS to hang, crash or pop up error dialogs. When it comes down to it, iNFekt offers a simple solution to viewing NFO files.